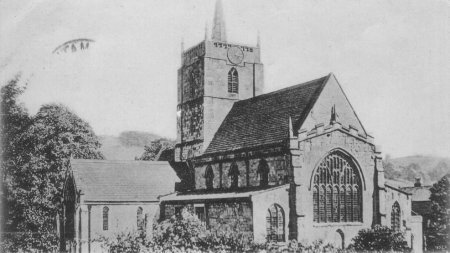 Taken 0930, 20 Aug 1859 by Alice Hurt showing castellations on the Nave, chancel and north transept; and upper windows of the north transept, all removed by Scott's 1870 restoration. Traces on the tower wall of the steep pre-1500 Nave roof can be seen. 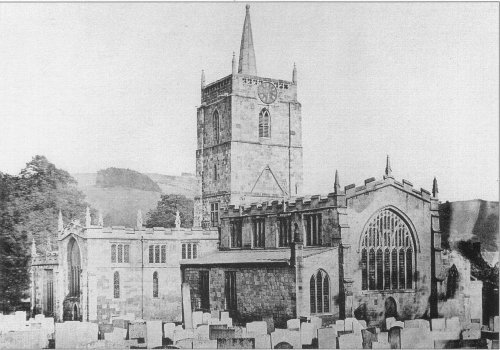 This is one of the earliest photos of St Mary's Church existing. 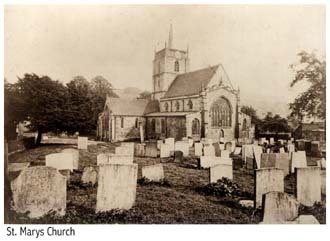 Taken about 1865 by J.W.Beeson, local schoolmaster, 5pm on a windy day. about 137 graves can be counted, (all removed today). Miss G Wood, 2 Rob Roy Av, off Gregory Av, New Linton, Nottm. Message:"How are you blowing old girl, are you tired, we have had a good walk it is very hot even Mam took off her jacket. Hope you sell a lot of papier mache things, don't do too much. I have been boozing all morn, had some ginger ale at Adam Bede's cottage. It is the one we passed on our Sunday morn walk, the one with --- & beer in the window."[unsigned]. 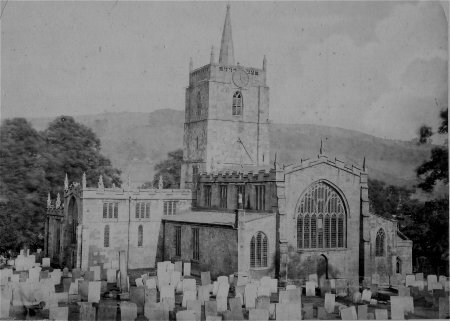 Taken c1920, still showing steep-pitch Nave roof. The old Grammar School can be seen on the left. The Saxon cross near the North Transept has been moved. 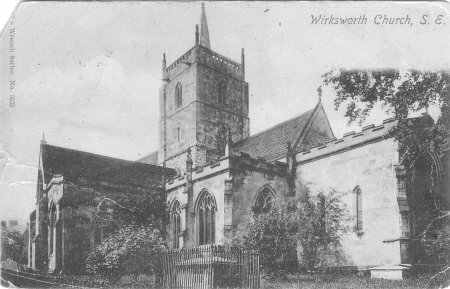 Taken c1930, showing the 1926 return to shallow-pitch Nave roof, and the widened West door. 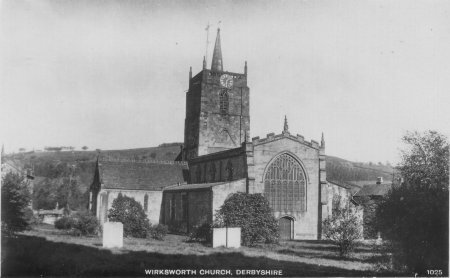 St Mary's is the Parish Church of the once very large parish of Wirksworth, and the home of the Wirksworth Parish Registers, surviving back to 1608. Refer to the Plan of the Church. 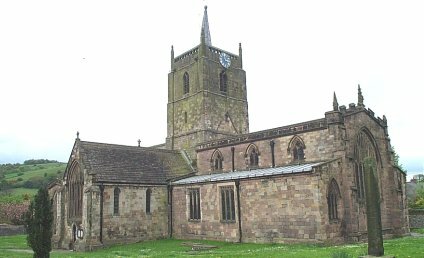 Views of the church looking SE show the nave, north transept, west-window and west door. 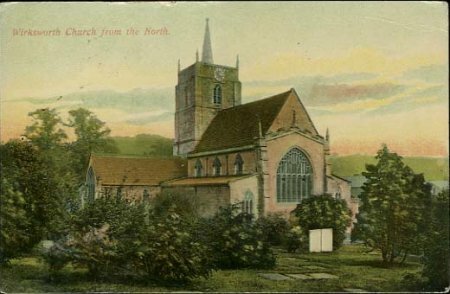 The great restoration of Sir Gilbert Scott in 1870 put a very high-pitched roof over the nave. In 1926 his roof was lowered to it present level, leaving traces of its former steepness on the tower wall. 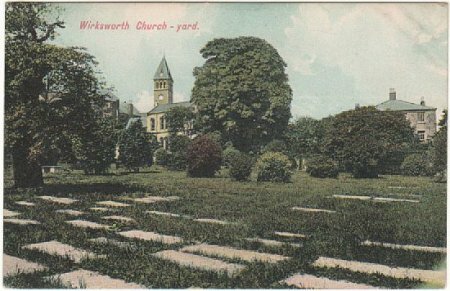 The churchyard was closed for burials in 1856, since then the headstones have gradually been moved. 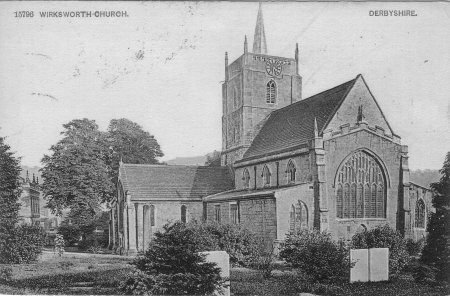 Postcard dated 30 Sep 1906. 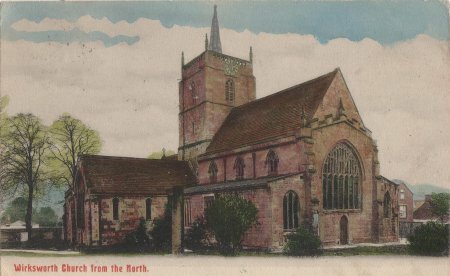 Addressed to Miss A Steeples, c/o Mrs Barker, 2 Renals St, Normanton Rd, Derby. From Marie Steeples, Waterlane, [Wirksworth]. Dear Annie, You will be pleased to hear I am coming to live with Mrs Jerram, 72 Osmaston Rd, [Derby] on Monday by the Dinner train. I shall be pleased to see you. 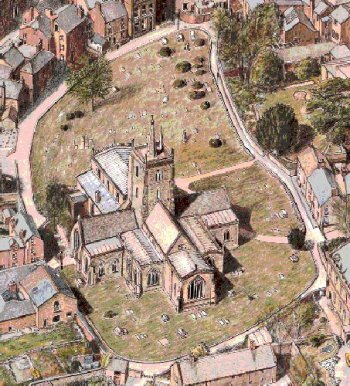 Drawn 1989, from Irene Bate's print of Wirksworth Centre, looking NW, showing the church inside its cathedral-like keep. 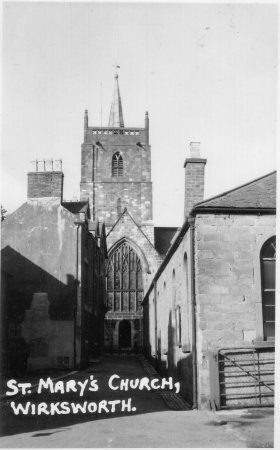 An unusual view of the church, looking North down St Mary's Gate at the South Transept window and door. On the right is a former hosiery factory, which later became the Parish rooms. On the left is No 12 St Mary's Gate.